Notifications help you to send messages and alerts to the responsible people when some important events or changes happen in the system. Notifications are a good alternative to views and dashboards. To stay aware your colleagues do not have to visit key views on regular basis. Instead, they receive updates just in time. In Targetprocess, there are email notifications of multiple sources: the ones configured in Notification Rules setup, Process Workflow settings, Following / Watch subscriptions, notifications optionally sent on Comment submission and @mentions. Push Notifications sent into mobile client apps are also supported. Automatic notifications can be also sent to external (third-party) services such as Slack using Webhooks. 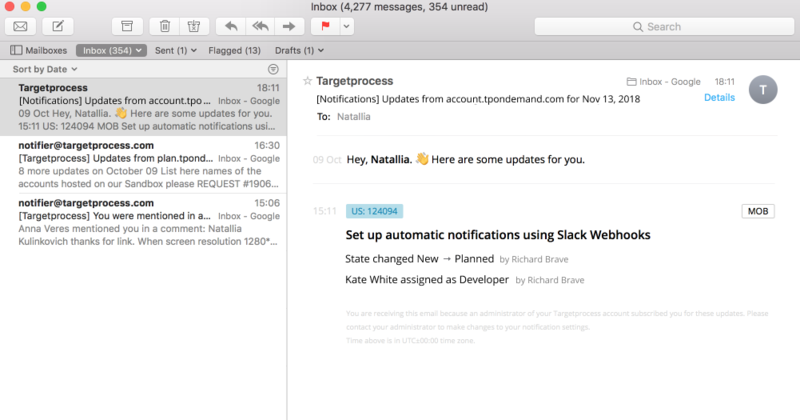 Notification Rules allow you to keep track of changes to Targetprocess entities by configuring and sending email notifications. In the current version, only administrators of an instance can set up notifications for any other Targetprocess user. 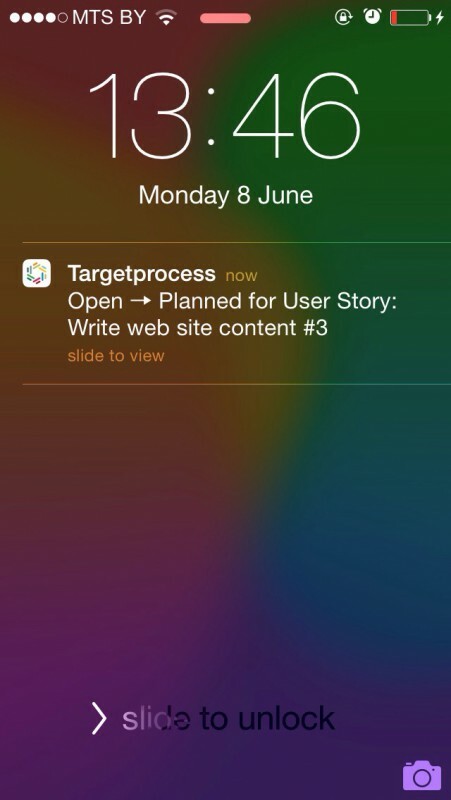 Targetprocess can be configured to send email notifications when something happens or changes in the system. For example, when an entity is created, assigned to a user, or commented on by someone. Notifications of this kind are configured per Process. Before making changes it worth to check what Process does your Project follow. Process Workflow notifications are configured by Administrators. Users cannot subscribe and unsubscribe from them at the moment. To control and sort incoming emails, users are welcome to set up rules and filters in their web-hosted inboxes or in the mail client programs. This feature allows a user to subscribe to a specific entity and receive digests about changes and updates related to it by email. 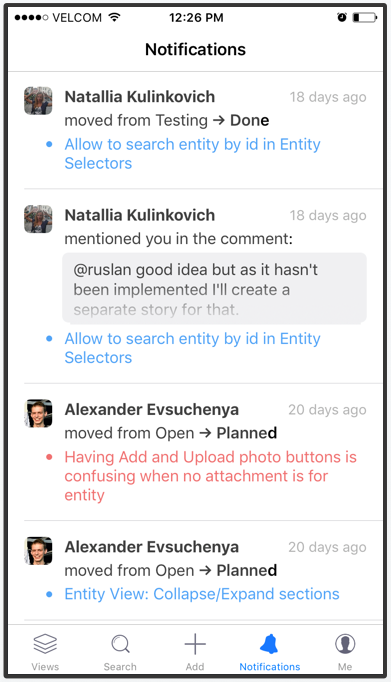 For example, a developer may follow a User Story and receive notifications about its effort changes, new comments, new attachments. You don’t need to follow entities one by one. 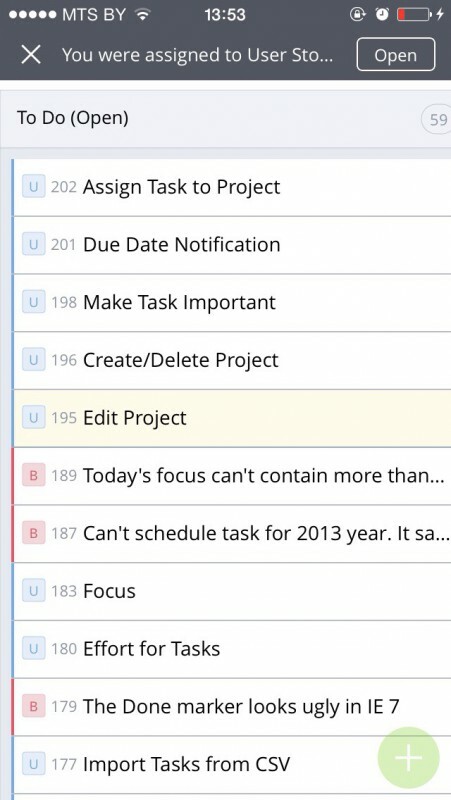 When you follow a high-level planning item such as Feature, Epic, Release, Sprint, Team Iteration, Project, you’ll automatically receive updates with all nested work items such as User Stories, Bugs. When you follow a high-level planning item, updates about Tasks will not be included into the notification. To receive information about Tasks, you need to follow their parent User Stories or Tasks themselves. When you follow some entities, you will receive email notifications with all important updates in these entities every 2 hours. Administrators and Project Managers cannot add a member as a follower of an entity (user stories, tasks, bugs, etc). However, it is possible to configure scripts for automatic subscription. How it works: when a user is assigned to any entity (e.g. User Story, Feature, Bug, etc. ), the script subscribes the user to the entity as a follower. Scripts are configured via Webhooks: Subscribe owner (creator) user as a follower; Subscribe assigned user as a follower. Webhooks process entities that are created after the moment when a webhook is configured. It is also not possible to view list of followers within UI. List of followers can be retrieved from the system within REST API call only. The notifications are sent upon selection made with special checkboxes below comment addition form. The settings of events are independent from Process Workflow notifications, while templates are shared with them. Sometimes while adding a comment you need to be sure that a particular person or whole team will read it. Just mention the person or the team you need in your comment and they will get an email notification. It works very similar to Twitter mentions. Type @ sign with the first letters of user’s or team’s name, then you will see a list of matching options. Select one you want. You can mention several people in a single comment for sure. Never miss an important work item again - unless you want to of course. You’ll receive notifications on your phone’s home screen when you are assigned or unassigned to an entity, when the state of an item you are assigned to changes (e.g. from “in progress” to “done”), and when you are mentioned or replied to in an entity’s comments. Push messages are similar to others in your notification center. They will also be displayed as a gray notification at the top of the application when it is running in the foreground. All notifications are shown in one place, so they're easy to find. Only Administrators in Targetprocess can add new and modify Webhooks. A getting started guide and more advanced details related to the usage of Webhooks are available on our Developers portal. It is possible to make Targetprocess send a notification to a specific Slack channel when an entity (for example, a Request, User Story, or Bug) is created in a specific project. In our developer's portal, you can read how to properly configure Webhooks both on the Slack side and Targetprocess side.